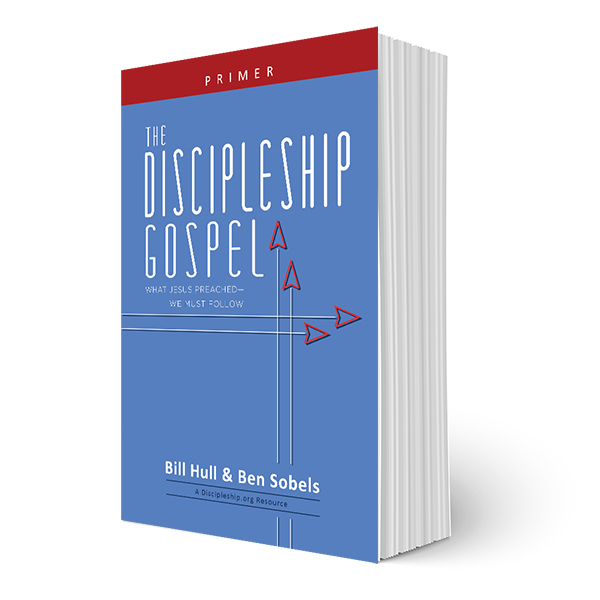 I'm pleased to announce the release of a new FREE eBook from the Discipleship.org eBook series: The Discipleship Gospel by Bill Hull and Ben Sobels. The Discipleship Gospel describes the gospel that Jesus preached, which includes following him—something often left out of preaching today. In this eBook, Hull and Sobels provide a biblical framework for preaching a gospel that's faithful to the good news Jesus preached. Our purpose is twofold. First, we introduce the problem with preaching non-discipleship gospels that don’t call people to be disciples. As such, these false gospels don’t lead people to make disciples. Second, we show that the New Testament Gospel writers made very clear to their audience seven essential elements of the gospel Jesus preached. Jesus’ gospel led his disciples to make disciples. Read this primer to grow in your understanding of the gospel Jesus preached. This eBook will help you make disciples by grounding you in the gospel of Jesus, because as they say in the book, "The gospel you preach determines the disciples you make." Bill Hull is the co-founder of The Bonhoeffer Project, which is devoted to creating disciple making movements in local contexts. Ben Sobels helps him as they train ministry leaders toward this end. For this short eBook, they come together to articulate the importance of grounding our disciple making efforts in the gospel of Jesus, so that we can be faithful to the Great Commission. Get the eBook free in your favorite format here. P.S. - Make sure to join us with Bill and Ben, who are leading a track called "Creating Disciple Making Leaders," at the next National Disciple Making Forum in Nashville, Tennessee this November 9-10. Register by clicking here.